Overloaded circuits in an older home can be an issue and is not uncommon with today’s demands for power. This article explores options for solving overloaded circuits in an older home. Older homes were not built to accommodate the demands of today’s modern appliances and other electrical devices. It can be dangerous to overload circuits. This is a situation where an electrical upgrade, performed by a professional, is a worthwhile investment. Q. Hello, I didn’t see anything on your site that would help. I live in an old house with seven circuits. Two are 220 for dryer and oven. Two are for plug-in outlets, one is for lighting, one is for AC/heater and the other I have no clue what it’s for. I mapped out my house designating the circuits and what I found was one circuit appears to be new and only runs one outlet in the house…in the living room and it’s a standard plug-in receptacle. My problem is my microwave oven, refrigerator, bathroom dryer outlet and computer are all on the same circuit. I know it’s overloaded because a professional checked it and said so. I would like to tap into the newer circuit that is left alone and run my refrigerator and (a future install) dishwasher off of it. Would you suggest this or tapping into this newer circuit and running my microwave and (future install) dishwasher? As it is, if I run the microwave while the computer is on as well as the refrigerator I pop a breaker. I would also like to know how to tap into this line. It’s a cinder block interior wall type construction so I don’t know how pulling wires would work. It appears the newer circuit was ran underneath the house and up through the floor. Would you suggest tapping into this circuit from underneath and running my wires up to my dishwasher and possibly the refrigerator as well? A: In this situation, you definitely need professional help! 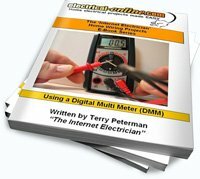 Your entire electrical system needs an upgrade so unless you just want to leave things alone (don’t add any loads, and try to distribute the loads you have now more evenly) you should have this work done. It will increase the value of your home, and if you ever consider selling it, any home inspector or savvy purchaser will make this a condition of sale. These older homes electrical systems were not designed for the electrical appliances, equipment and loads that we use today. A dishwasher, a microwave, and dryer outlet all require their own dedicated circuits. To add on to the least over-loaded circuit is just asking for trouble. Get a professional in to give you some quotes on a proper upgrade. It will be money well spent to increase the value of your home, and most importantly your safety and peace of mind! This entry was posted in Troubleshooting and tagged circuitry, circuits, dedicated circuits, do-it-yourself, electrical demand, electrical system, electrical upgrade, older home, overloaded circuits, service upgrade, tripped breaker. Bookmark the permalink.